A couple married friends of mine are my dinner-party regulars. They are not only basically my underpaid taste-testers, but they also enjoy cooking and hosting me as well. Justin and I used to have a deal that each time we’d have dinner, there would be a new “featured cocktail” of the evening. He has always been a much better bartender than I, so it was a way for me to try some of his fancy drinks as well as increase my own mixology skills. Somewhere along the way that tradition faded out and I would simply resort to plain old wine. Popping a cork seemed much easier than figuring out a new themed drink to make in addition to all the food I was already making for my guinea-pigs friends. Well I think next time I host, I’m re-instating the cocktail tradition! 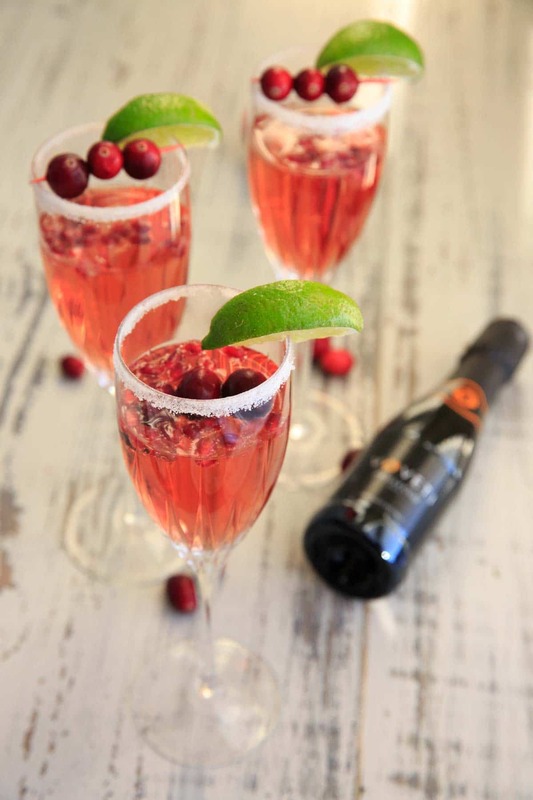 Because I found something just as easy: this Cranberry-Pomegranate Prosecco Cocktail. The best part about this is that is looks and feels fancy, but it’s perfect for everyday entertaining. Sugar-rimmed glasses. Fresh fruit. A little juice. And of course the sparkling wine. 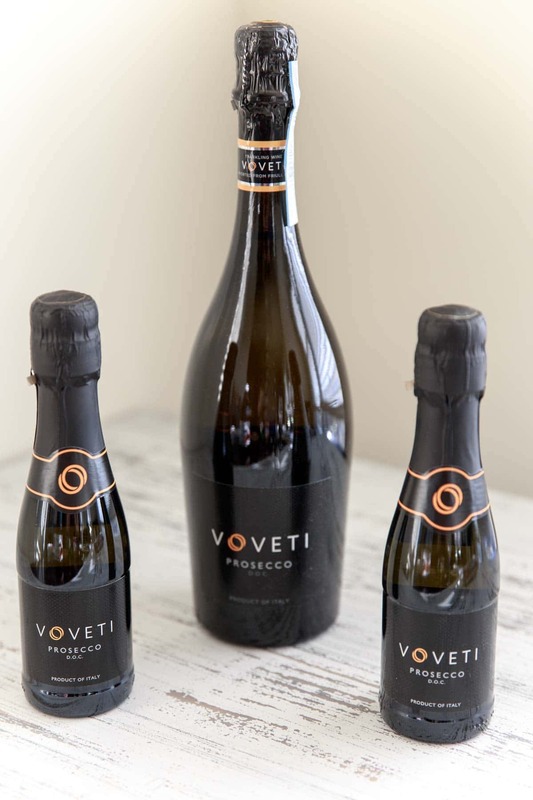 Voveti has the regular-sized 750-ml Prosecco bottles for sharing, but they also have these cute mini bottles (187-ml) that might be easier for transport. I’m a fan of this brut-style (meaning dry, very little sweetness but still fruity), and it’s tempered acidity. The fresh, graceful profile pairs very well with fresh fruit. 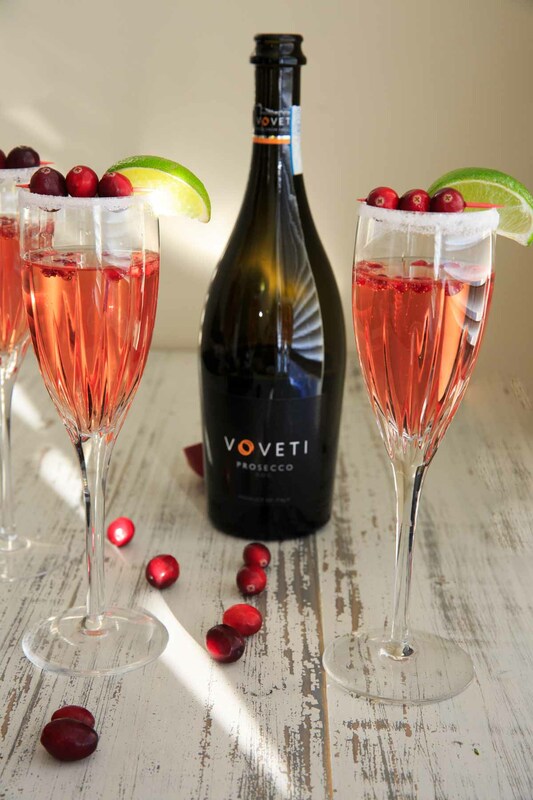 An easy drinking cocktail that your friends will be happy you’re sharing with them! First step – the sugar-rimmed glasses. It helps to learn how to make bartender-style lime wedges! Cut a lime in half on its longest side. Perpendicular to the direction you cut the lime, cut a slit inside each half (careful not to cut all the way through, but deep enough to let some of the juice out). Continue to cut lime halves into wedges. If you’ve already cut the lime, you can also make the slit in each wedge. Either way, you then rub the lime around the edge of the glass, and then dip into a shallow bowl of sugar. 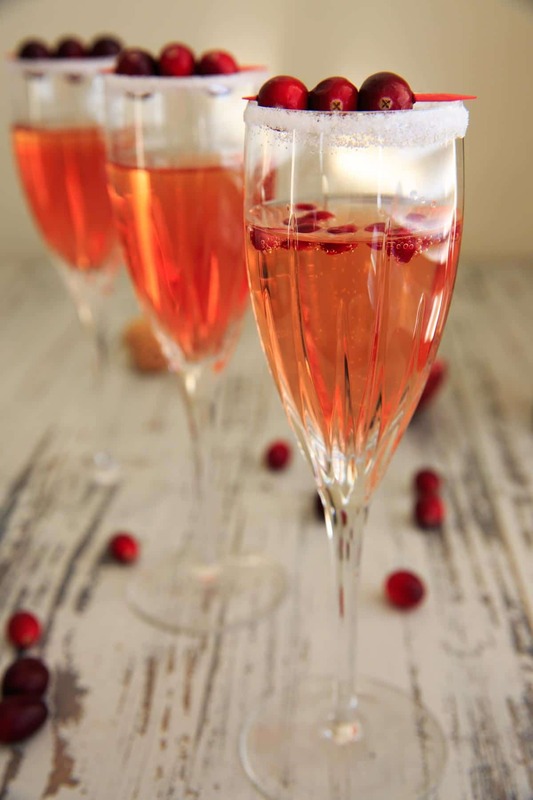 Pour your Prosecco in, add a little juice and garnish with fresh cranberries and pomegranate seeds. PRO TIP: Use toothpicks to put the cranberries on, if you don’t want them simply floating in your drink. Don’t forget those lime wedges! 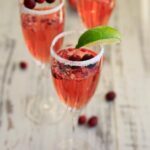 This Cranberry Pomegranate Prosecco Cocktail is a great way to jazz up your happy hour without making it complicated. This fresh-tasting, fruity drink is great to share with friends or make for date night! Pour sugar in a small, shallow bowl. Cut a slit on the inside of a lime wedge and rub around the rim of a champagne flute, and then dip the glasses into the sugar bowl. Repeat for remaining glasses. 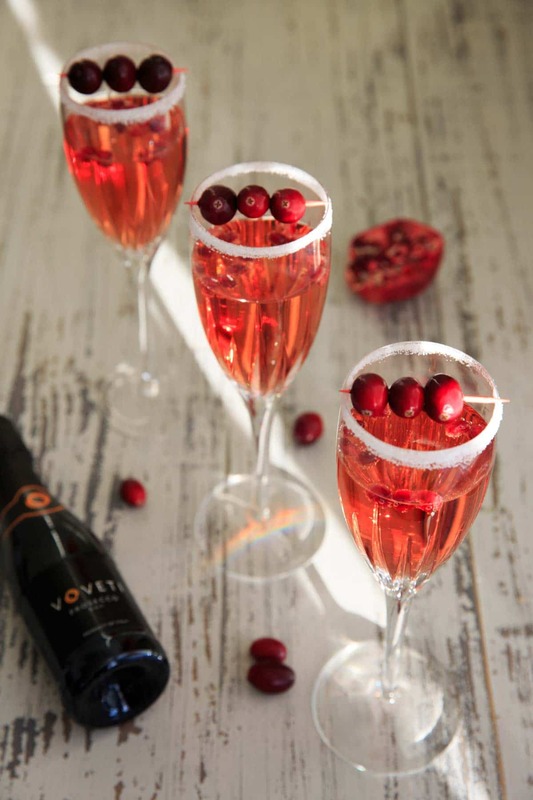 Fill glasses with prosecco and cranberry-pomegranate juice (2 tablespoons per glass). 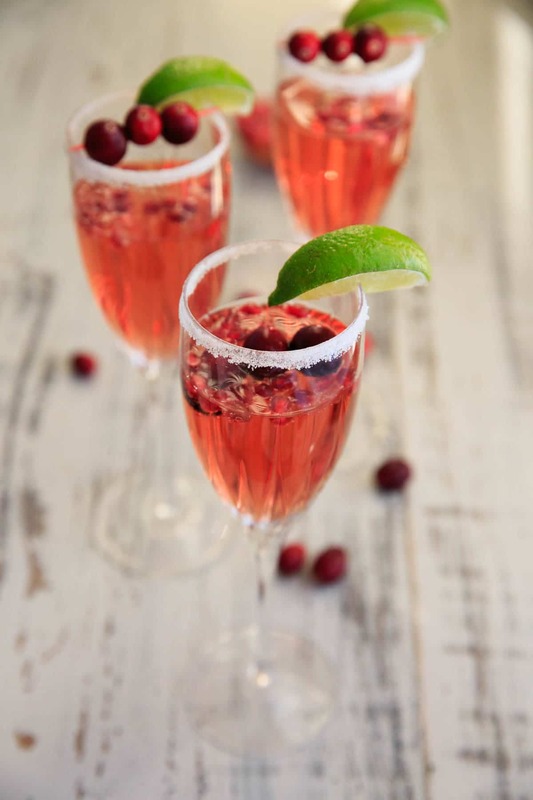 Garnish with fresh cranberries, pomegranate seeds, and lime wedges as desired. *If you can't find a cranberry-pomegranate blend, use half cranberry half pomegranate (i.e. 1 Tablespoon of each juice per glass). 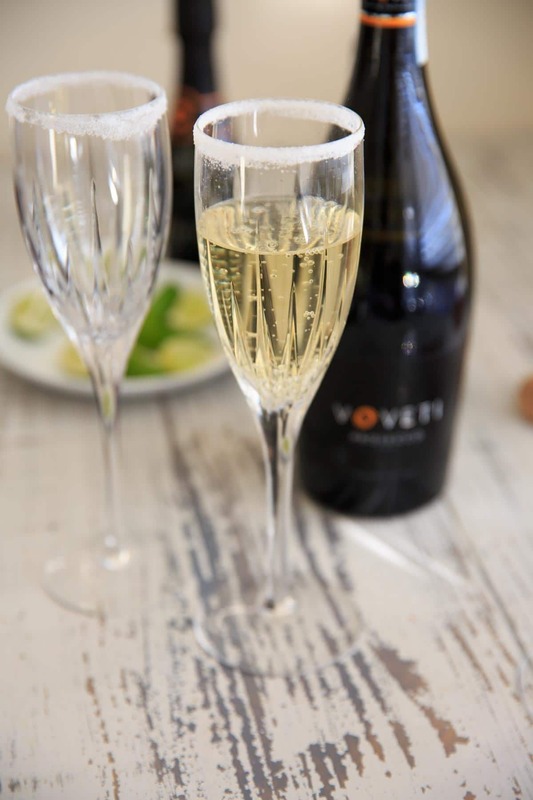 We love prosecco! And those little bottles are adorable! 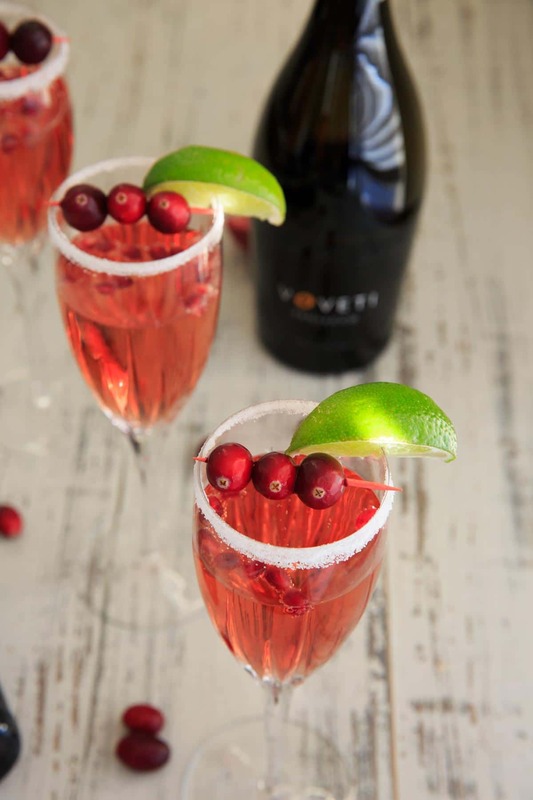 So pretty and a perfect cocktail for the holidays! I love the sugar rimmed glasses for an extra special touch. Thanks for the great idea. This is so tempting. I am saving this one for my holiday gathering next week. Thanks for sharing. Combining these two seasonal flavors in a cocktail, yes please. I will have to make this really soon. Maybe for New Years Eve.